By Samir Paul, teacher and former candidate for Delegate in District 16. The recount is over, and we came up short by just 12 votes out of over 56,000 cast. I am unbelievably proud of the campaign we ran. 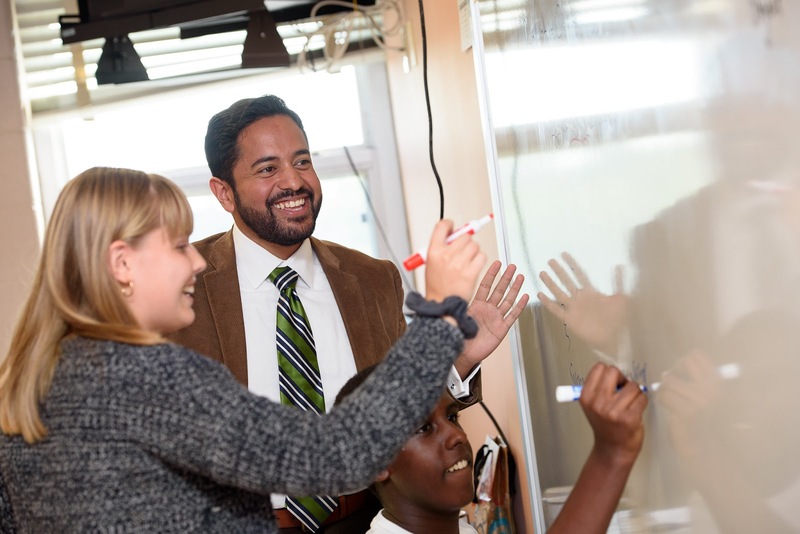 We built thoughtful, progressive policy proposals that sparked conversations across the district. We discussed those plans together on 31,543 doorsteps over eight months. And we inspired 11,287 voters to take a stand for the public schools our children deserve. While it’s tough to lose so narrowly, the truth is that candidates like me – a young, middle-class, public school teacher and immigrant son with a funny name – aren’t supposed to come this close when running in a race like this. And in the end, we have a team of outstanding advocates for transit, women and families, and civil liberties representing us in Annapolis. Congratulations to Marc, Ariana, and Sara and to fellow candidates Marc, Joe, Nuchhi, and Jordan on a great campaign. “Mr. Paul goes to Annapolis” would have been a satisfying civics lesson for my students, but “Mr. Paul showed me how to fight for what I believe in” is a pretty good second choice. To all of those young people: please please please continue to assert yourselves in our public life. You are light years ahead of where I was at your age, and if I could make your votes count double, I would. Thank you for blessing me with the gift of your time and trust and sweat and belief. When young people learn how to take take a stand, how to be part of a community, and how to fight for the future they’ll someday inherit, we all win. For every old friend who wrote a check, for every new friend who hosted a meet-and-greet, for every young person who knocked on doors — it’s impossible to overstate the gratitude I feel in my heart right now. I have spent almost a year asking everyone I know to help me in some way or another, and it’s been amazing to see people answer the call even right up until the very end. And, of course, I am deeply grateful to my parents, who left everything and everyone they knew to come to a country where this kind of thing is even conceivable within one generation. It was incredibly difficult to run this campaign while teaching, and I am more tired than I’ve ever been in my life, including my first year in the classroom. So I’m going to take a break for a little while and reflect on what exactly the next phase of my advocacy should look like. But Maryland STILL has a once-in-a-generation overhaul of our school funding next year; young people are STILL being gunned down in our schools and on our streets; climate change STILL hangs over us like a guillotine; immigrant families STILL struggle to survive and to see themselves reflected in public leadership; and our economy is STILL oriented toward the past rather than my students’ future. So even though I won’t be the one casting votes in the House of Delegates next session, there’s plenty of work for all of us if we want to make this place more just, inclusive, and abundant. I don’t know where this train stops next, but I will forever be grateful for the ride we’ve been on together. District 16 House candidate Samir Paul, who led for most of the ballot counting over Sara Love but now trails by nine votes, is raising money to finance a recount. We reprint his blast email below. It’s normal, I think, for a result this close to sting. But as I wrote to my campaign team 11 days ago on an uncertain election night, we overcame some absolutely massive disadvantages to run a campaign that has surprised many of the political insiders who didn’t think a middle-class, immigrant-son teacher like me could compete in a race like this. Win or lose, we definitely won. In a race this close, every single thing we did mattered. Every door you knocked when you were tired and sweaty, every stranger you greeted at the polls when they were just slightly out of your way, every phonecall you made or email you sent or dollar you gave or tweet you tweeted or postcard you hand-wrote. All of it made this quite remarkable outcome possible, and none of that happened by accident. It happened because of YOU. So thanks for everything you’ve done so far. If you can kick in a little more for our homestretch recount fund, please stay in the fight with us. I’ll keep you posted as we learn more and — regardless of what happens — I’ll keep fighting for a more just, inclusive, and abundant world. Here is something we haven’t seen before: a mid-term year Apple Ballot with one candidate occupying one side of it and a list of others on the other side. 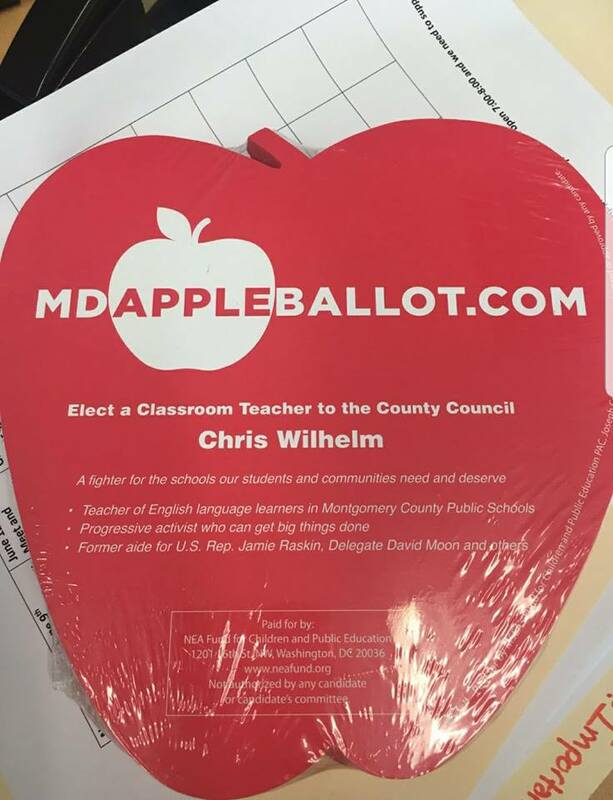 This Apple, still in wrapping, is customized in favor of Council At-Large candidate Chris Wilhelm. Here is another one spotlighting District 16 House candidate Samir Paul. The Apple we were given at the Wheaton early voting site was not like these. It had county candidates on one side and state candidates on the other, a typical format used in the past. Wilhelm and Paul are MCPS teachers. We totally get why MCEA would like to elect its own members to office, although that has not always been their top priority. For example, the union endorsed County Council District 5 incumbent Derick Berlage over MCPS teacher Marc Elrich in 1998. In Elrich’s 2002 and 2006 races, he did appear on the Apple but we don’t recall him getting an entire side of it to himself. The races involving Paul and Wilhelm are very different. In District 16, the two incumbent Delegates – Ariana Kelly and Marc Korman – are endorsed by MCEA and a lock for reelection. Paul is in a tight contest with fellow new candidate Sara Love for the open seat being vacated by Delegate Bill Frick. He needs every edge he can get. The Council At-Large race, on the other hand, is extremely competitive and unpredictable. MCEA has endorsed incumbent Hans Riemer, Brandy Brooks and Will Jawando in addition to Wilhelm. Riemer seems likely to be reelected but that’s about all that can be safely predicted in this race. What will Riemer, Brooks and Jawando think of the Wilhelm Ballot? Josh Starr was Superintendent of MCPS from 2011 through 2015 and still lives in MoCo. He announced the candidates whom he supports on Facebook yesterday. Agree with Starr or not, his personal experience of working with state and county elected officials gives him a unique perspective on those running for office. With his permission, we reprint his post below. 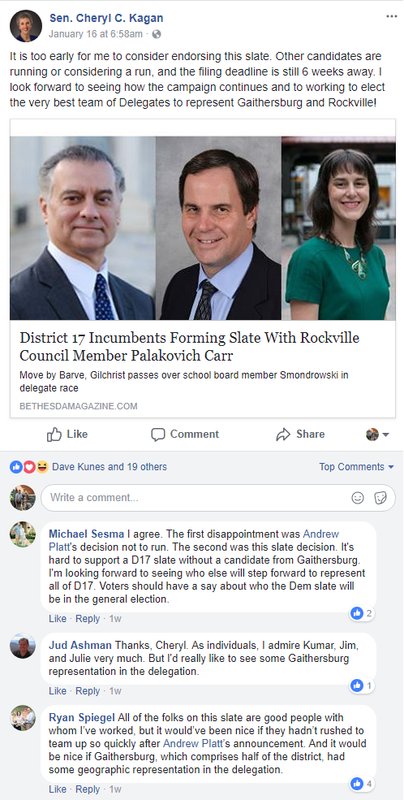 Very long post for my MoCo friends about my choices for the primaries, with notes/comments where I feel it’s appropriate. Please note that my choices and/or comments are based on my personal knowledge and experience with these folks, not any deep analysis of every statement/position/vote they’ve made. I definitely have biases. Governor – Rich Madaleno; Baker would be my #2. When I was super, I found Rich to be one of the smartest, most thoughtful and most knowledgeable elected officials, esp. around budget. He was also one of the first Dems to push back against Hogan. Experienced, smart, progressive, would be a great governor. I’d also love to see an open member of the LGBTQ community elected governor, although that’s in no way the primary (pun intended) reason I’m supporting him. Congress – Jamie Raskin, because he is, after all, The Jamie Raskin. Ariana Kelly – solid, speaks out on issues re: women, no reason for her not to continue in Annapolis. Marc Korman – smart, thoughtful (in my LM class so I got to know him well), definitely a bright future. 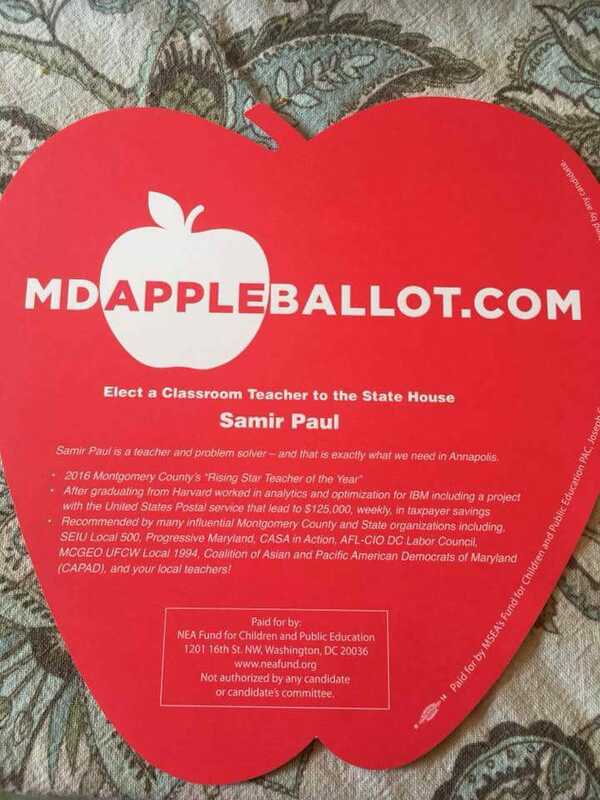 Samir Paul – have had a few conversations with him, very sharp and we need more teachers in office. County Executive (wherein I get a little snarky based on my experiences with many of these candidates). I also think the next CE might be a transitional leader, as we move from 12 years of Ike during an economic downturn towards a new vision that supports bold economic development with progressive politics. I’m supporting Roger Berliner as I’ve always found him to be thoughtful, a really good listener/learner, consistent and progressive. I’ve always felt Roger tries to do the right thing in an inclusive and reasonable way and will work hard to bring people together around his vision. Blair – don’t know much about him, not a huge fan of business leaders assuming they can “save” public entities. I’m pretty agnostic. Elrich – have always appreciated his progressive politics, always had a solid working relationship, sometimes I appreciate his willingness to take strong positions, sometimes I think they’re unforced errors; major concern is the big hill he’ll have to climb to convince a wide swath of the county that he can do economic development and enact a very progressive agenda. Frick – there are some things I like about him, personally and professionally, but my experience with Roger Berliner outweighs any support for Frick. Krasnow – don’t know her, but I hear good things, sounds like a solid choice. Leventhal – based on personal/professional experience, I’m in the anyone-but-Leventhal camp. He doesn’t have the temperament or leadership skills to be CE, despite his sometimes-engaging personal style and progressive politics. Please, trust me on this one. Gabe Albornoz – smart, engaging, thoughtful, has a very bright future; very supportive of kids and MCPS. 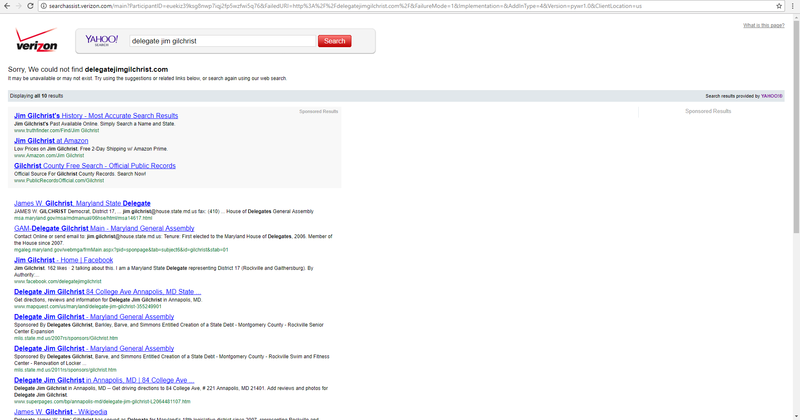 Hoan Dang – what I know, I like. Will Jawando – he deserves a shot. Hans Riemer – very education focused, solid on economy and progressive issues, always had a good working relationship, we need someone with experience and we need a degree of stability. I am also in the anyone-but-Jill Ortman Fouse category, based on my experience with her as a board of education member while I was superintendent. Trust me. Peter Fosselman – solid, good record in Kensington, deserves a shot at council. At-Large- Karla Silvestre, glad to see her running, great community leader, smart, thoughtful, will be a great BoE member. D3 – Pat O’Neill, because she deserves a shot at the MD record for longest serving board member. On a serious note, she knows what the role of a board member is and provides an essential balance to other board members who think their job is to run the school system.